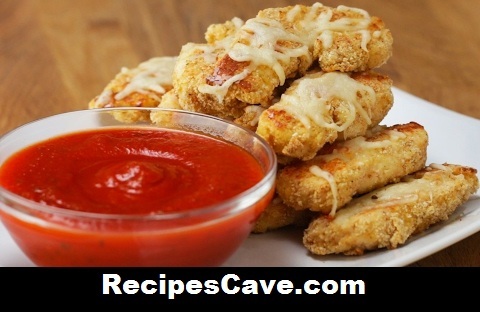 Chicken Parm Strips Recipe - Here is step by step guide how to cook chicken parm strips at home follow these simple steps. Here is what you'll need to cook Chicken Parm Strips for Servings: 4-6 peoples. In one medium-sized bowl, mix the bread crumbs, parmesan, salt, and pepper. In another bowl, crack the eggs and whisk until scrambled. Coat the chicken in the egg, then in the bread crumbs, then repeat. Place the chicken tenders on a baking tray and bake for 20 minutes, flipping halfway through. Sprinkle each tender with mozzarella and bake again for 5 more minutes, or until cheese is melted. your Chicken Parm Strips Recipe is ready to taste.